Today I will venture into yet another new country, Serbia. 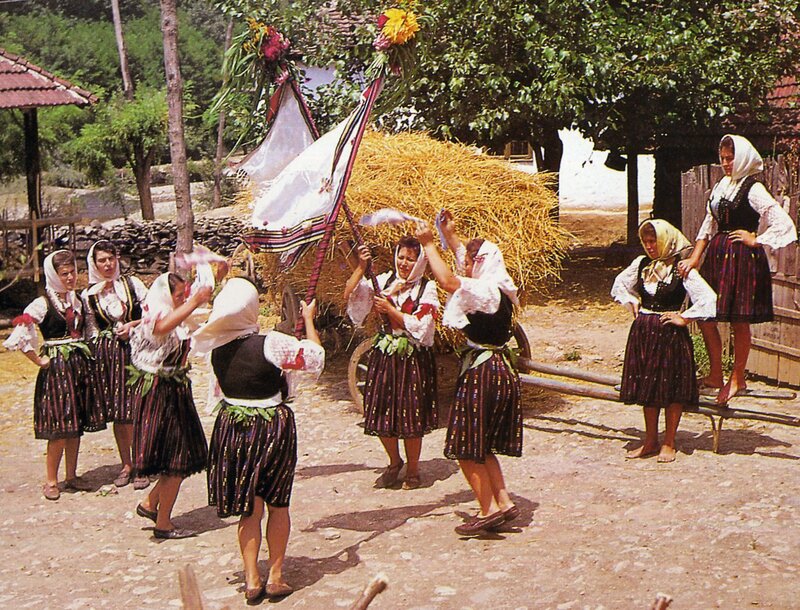 It is more difficult to find material on Serbian Folklore than it is for Croatia, for example. I am not sure why this is the case. Serbia has been a very forward looking country since they emerged from under the Ottoman Empire. I will be covering the most common Serbian costume, that of central Serbia, or Šumadija. 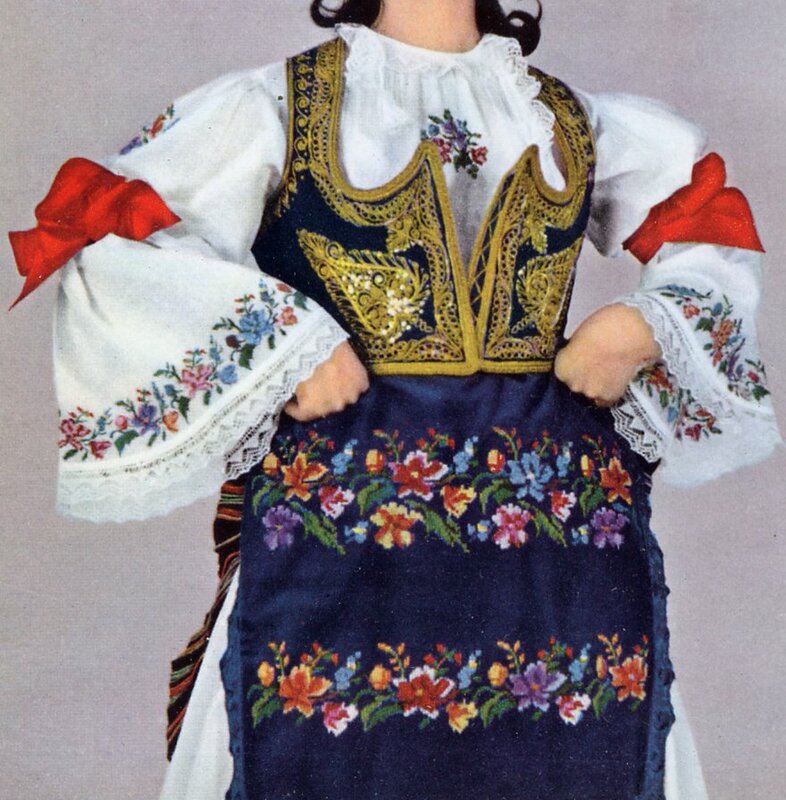 This is the heart of Serbia, extending from Beograd south along the Morava river.This costume comes in several forms, varying mostly in the type of skirt. As in most of my posts, I will not be able to cover every variation. This photo above shows one of the more common versions. 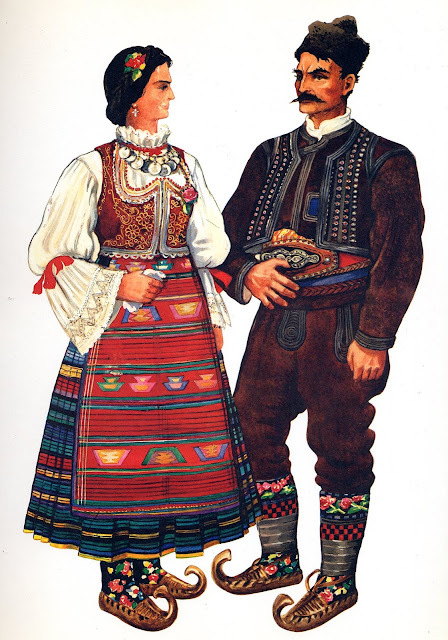 The basic garment, as in the rest of the Balkans and much of Eastern Europe, is the chemise. Typically there is a band collar and no cuffs. 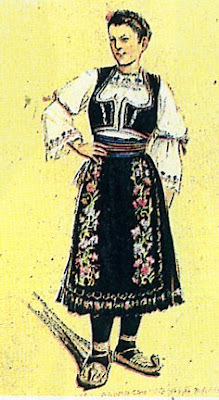 One typical feature of the Serbian chemise is that the sleeve is gathered just above the elbow. Very often a red garter or ribbon is tied around the arm at this point, as in the photo above. 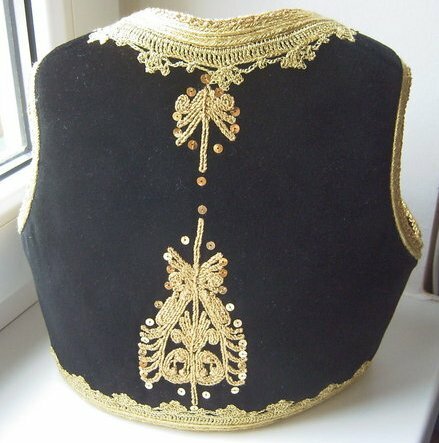 There is embroidery around the sleeve opening, around the neck opening, often on the lower part above the hem, and very often a spot design on the upper sleeve, above the gathered area. 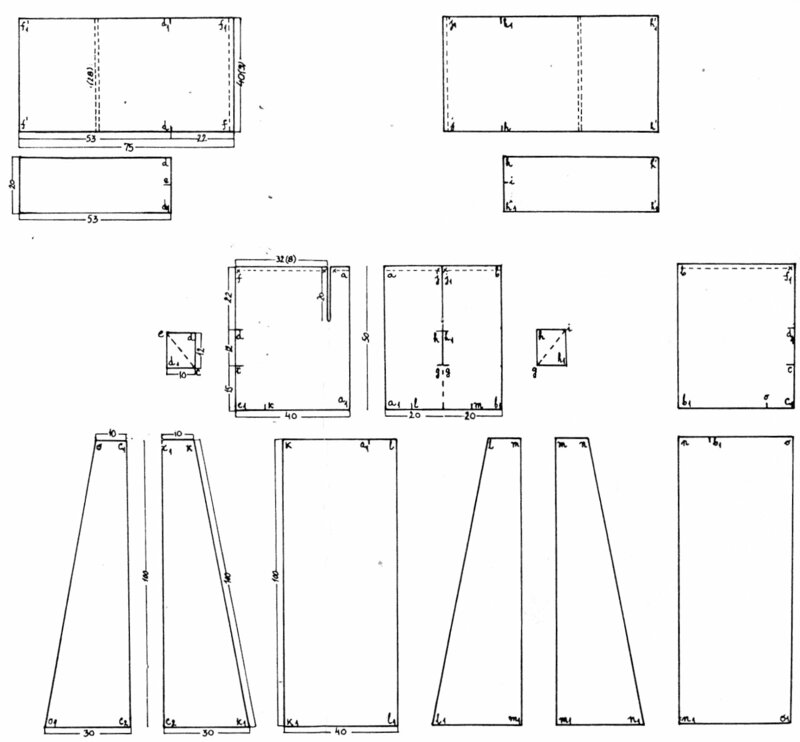 There is very little material on the traditional designs used. 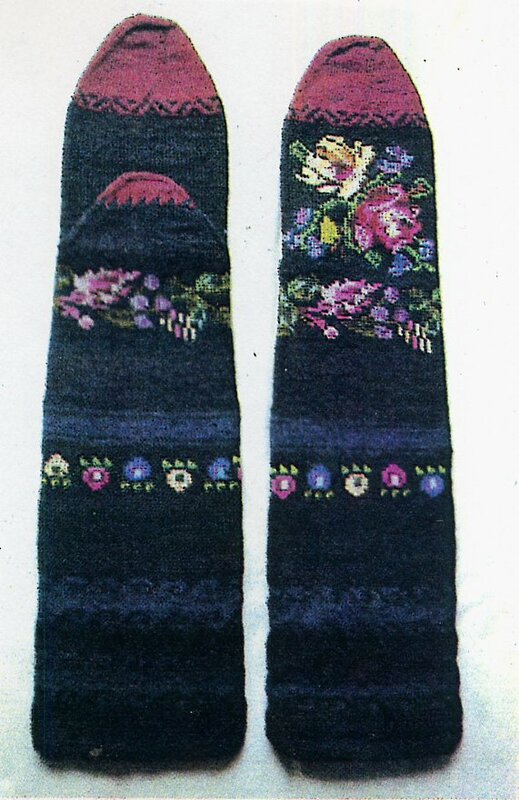 Today what is seen in almost all cases is multicolored cross-stitch floral designs which are very reminiscent of Berlin Work. This is of recent origin, not going past the mid 19th cent at most. 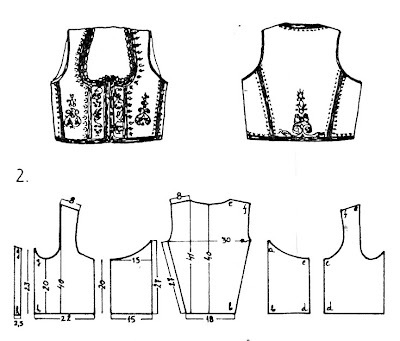 There are various cuts used for the chemise, here is one version. 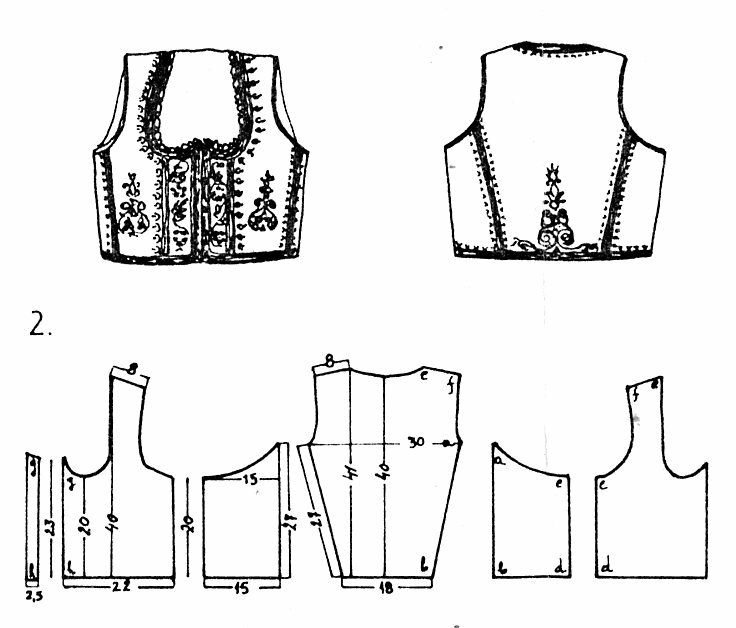 There are also versions in which the sleeves are set in perpendicular to the body. 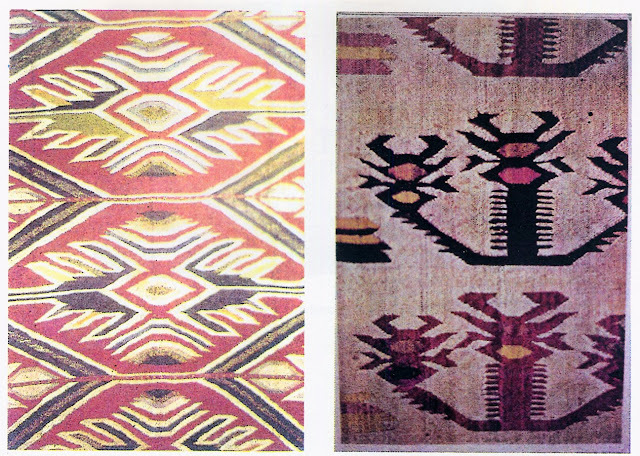 The pieces used are narrow because the constraint of a hand-loom does not permit wider pieces to be woven. There are various vests or bodices worn with this costume, called pamuklija, djudica, grudniak, zubun, etc. The most commonly seen today is the one called jelek. Each of these vests has a different cut. The jelek is short, coming just to the waist, it hooks closed in front, with a point in the center and a curved opening on either side. 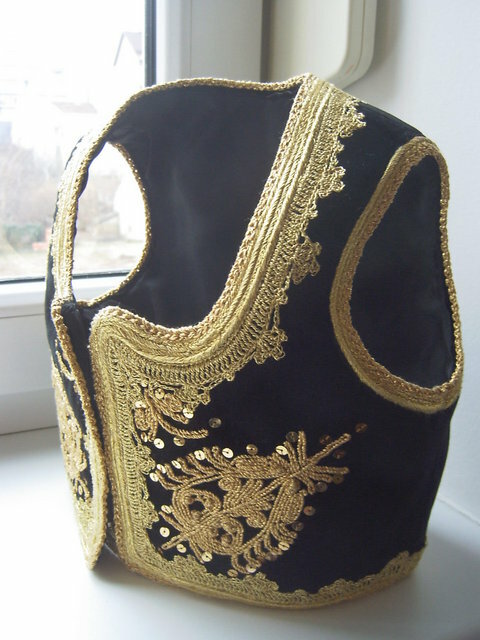 It is usually red or black, and typically has rich ornamentation consisting of couched gold braid. For young women the neckline is low, functioning as a bustier, but for older women the neckline may be considerably higher. 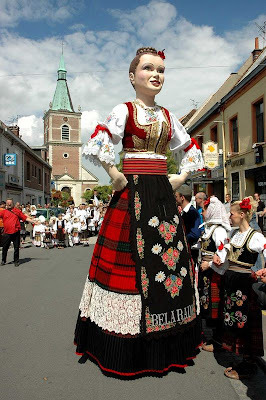 There are various types of skirts worn with this costume. One of the oldest and simplest is the two apron version. 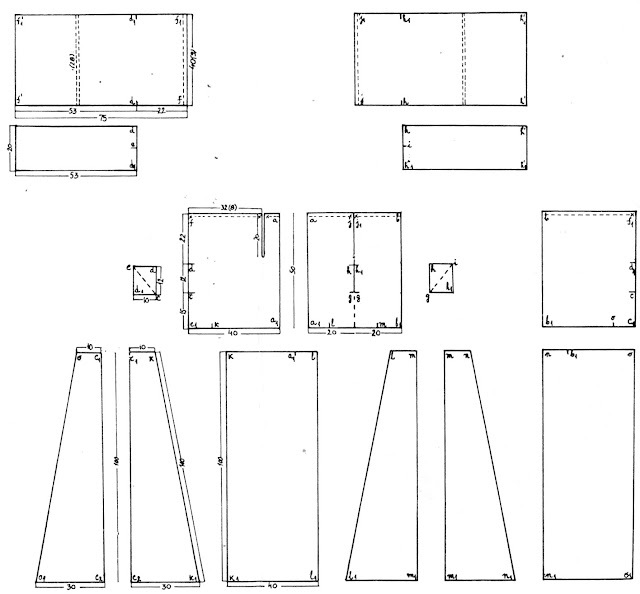 This has two aprons of a single panel each, the front apron being ornamented and the rear apron mostly plain, with ornamentation just along the bottom. 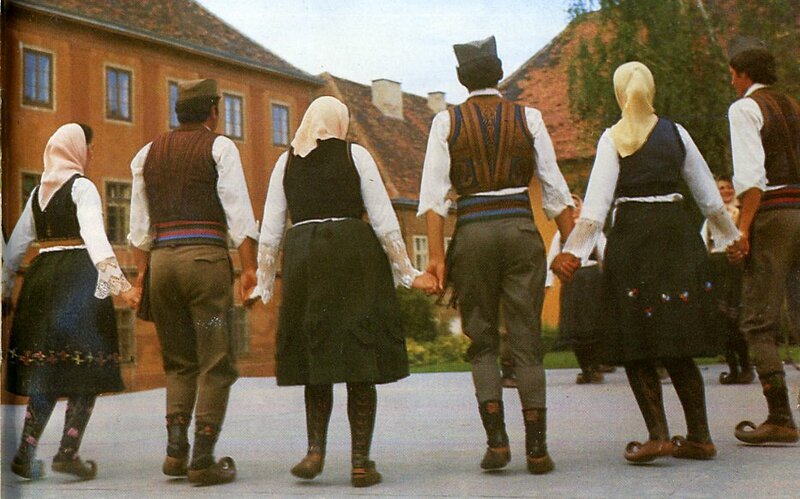 This is common over much of eastern Europe. 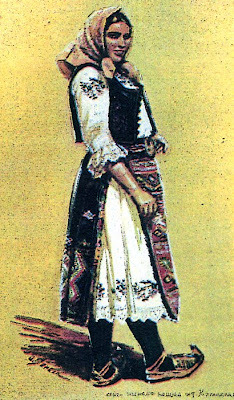 Here is a painting by the artist O. Benson showing a young woman from the village of Kumodraž near Beograd. On the left is a rear apron, on the right is a front apron. 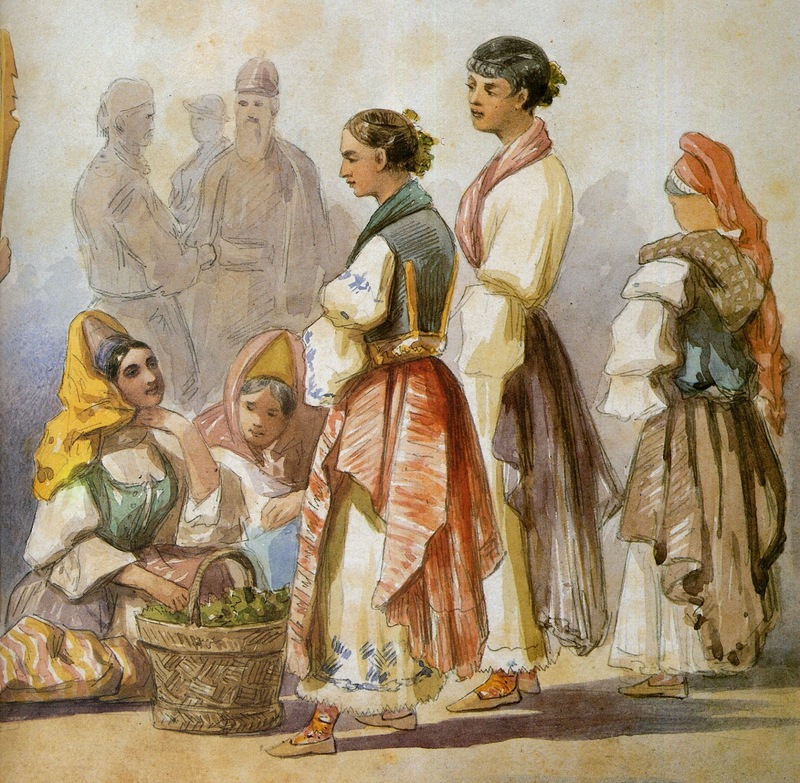 This is part of a painting by the artist Carol Pop de Szathmari, of a scene in a market in Beograd in the mid 1800's. 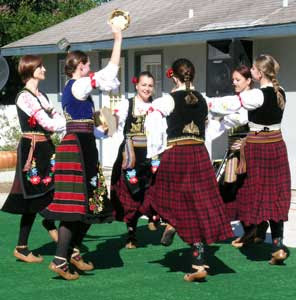 What is most commonly seen today is a closed skirt woven in narrow stripes or plaid, often of two widths of cloth sewn together horizontally, with the plaid deliberately not matched. This is pleated finely, and usually has a black velvet hem and lace sewn onto it above that. See the image at the top of the article. 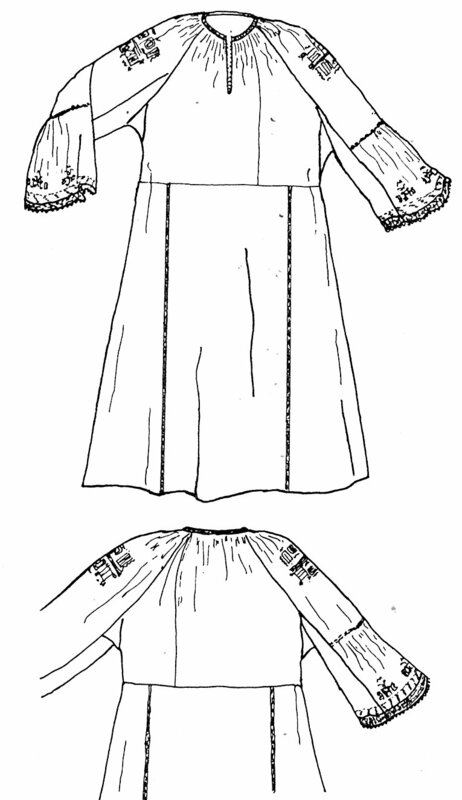 Some forms of the skirt were plain in color with a decorated hem, either wide or narrow. Here is another part of the same painting by Carol Pop de Szatmari. The artist has painted himself into the scene at right. He was apparently a Hungarian Orthodox Priest. 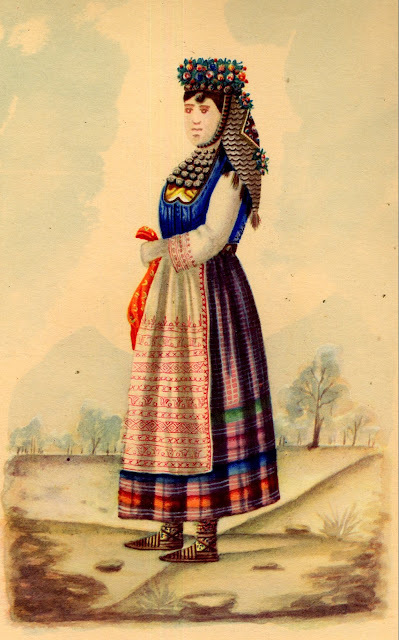 Below is another painting by Benson showing a young woman from the village of Kusadak. 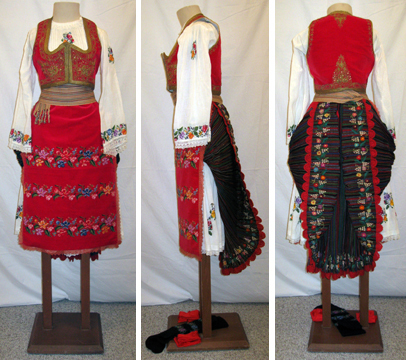 Some contemporary versions of the skirt in particular communities have become quite short.The first photo is from Užice. 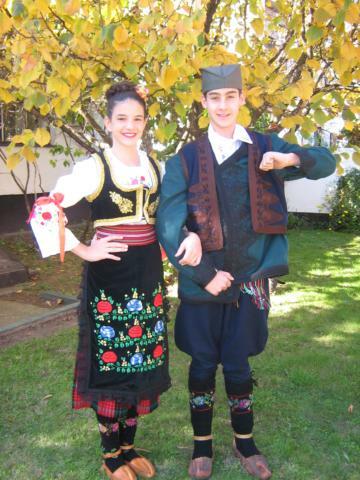 The second is from southern Pomoravlje. 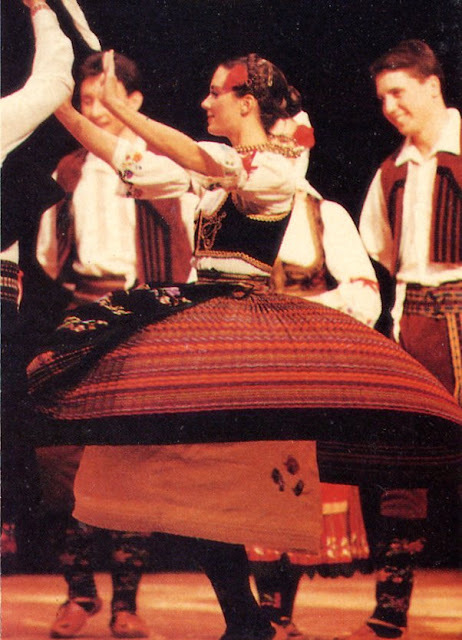 The most spectacular version of the skirt is basically the same as the narrow pleated one, but is not sewn closed in front, and is worn with the corners tucked into the waistband behind. This gives the outfit a lot of movement. 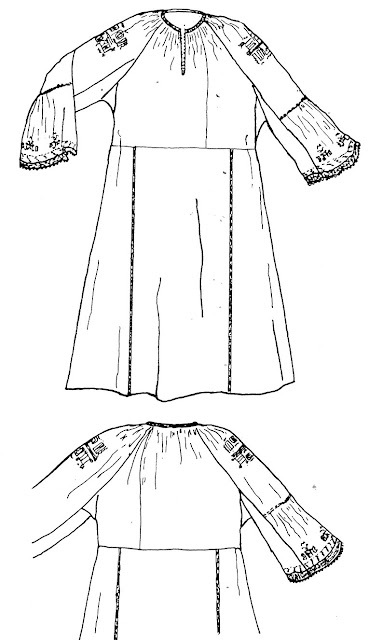 Typically the hem that shows is ornamented with crochet and embroidery. See some of the images above. Here are a couple more images of that type of skirt. 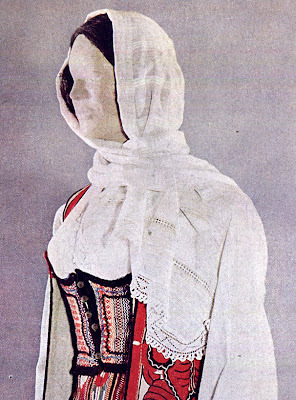 The kerchief wrapped around the torso seen in these last three images was commonly worn in the mid 1800's, under influence of Western fashion of the day. This has died out and is no longer seen. The last image is of a painting by Nikola Arsenović, who also painted in the mid 1800's. 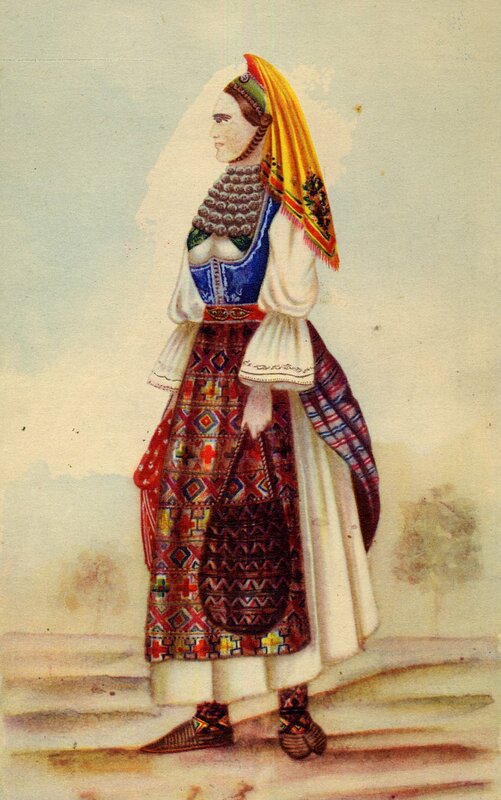 The apron is traditionally woven in tapestry technique, with colorful geometric motifs. Today it is more commonly made of red or black wool with floral cross-stitch or crewel embroidery. In the past, unmarried girls and brides often wore embroidered linen aprons, as you can see in this painting by Arsenović This is rarely seen today, however. 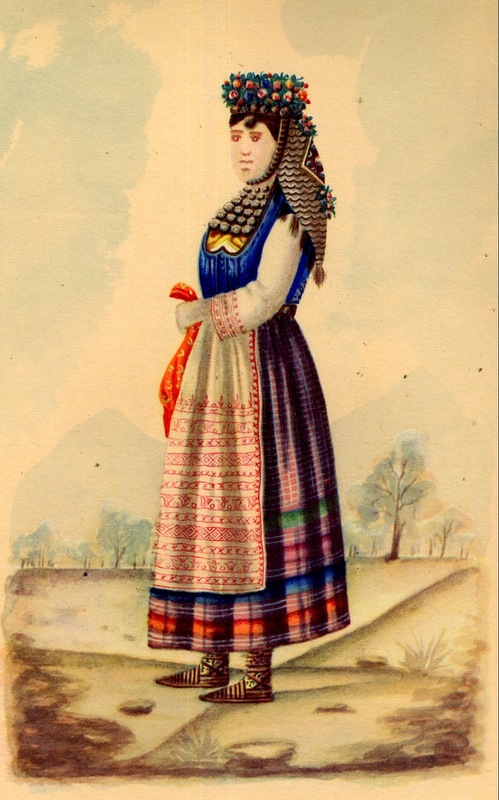 There is often a striped sash tied around the waist. The stockings are hand knitted, either with geometric, or more often, floral designs either knitted into or embroidered onto them. 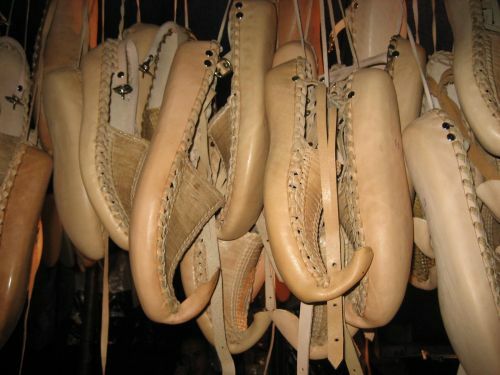 The traditional footwear are moccasins, which are called opanci, They have thin goatskin strips woven on the uppers, and stereotypically in Serbia have curled toes. This is not traditionally true for all communities, but they have become somewhat of a symbol of Serbia. This last painting is by the celebrated Jugoslavian artist Vladimir Kirin. Thank you for reading, I hope that you have found this interesting and perhaps inspiring. Here is a website showing how a Serbian community in France made a 'parade giant' figure in Serbian costume named Bela Rada. There are many photographs of the finished figure, of the details of her costume and how she was made. Quite fascinating. A couple of Serbian groups performing traditional dances. Serbian dances are famous for small precise intricate footwork. This video shows the winged skirt. Always enjoy your posts, Roman. I learn so much. Nice blog. 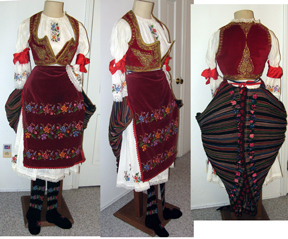 Maybe this link can help you with Serbian costumes in almost all of it's varieties. This is a website which i have not encountered before. what an incredible wealth of information. This should be published as a book!! 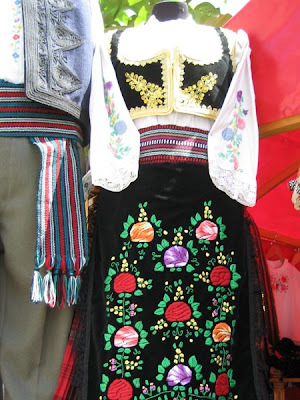 Dear Roman, I am also searching on available material on the symbolism of embroidery in Serbian costume. 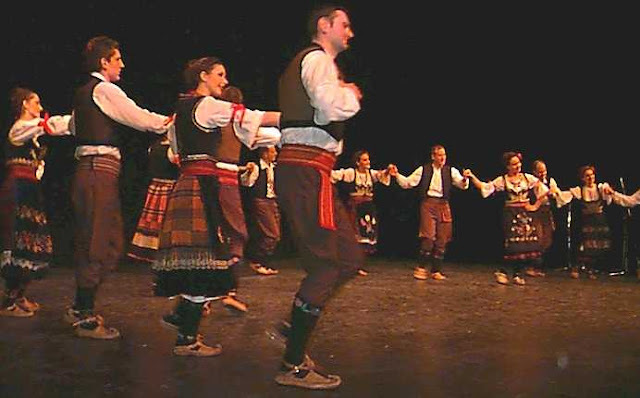 You have chosen to focus here on a traditional costume of Sumadija because it is most represented in the Serbian dance performances throughout the world. I appreciate your approach and information here. Not much has been written/ published on embroidery art in Serbian costume. I recently found the author who was one of the first female academics who were interested in this subject. 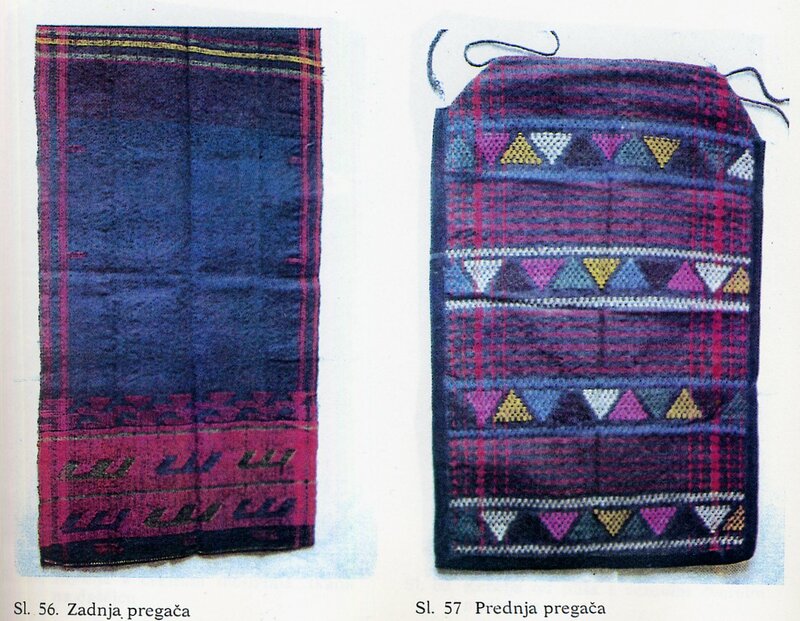 Her name is Jelica Belovic - Bernadzikovska: " Serbian embroidery and textile ornaments" from 1907. 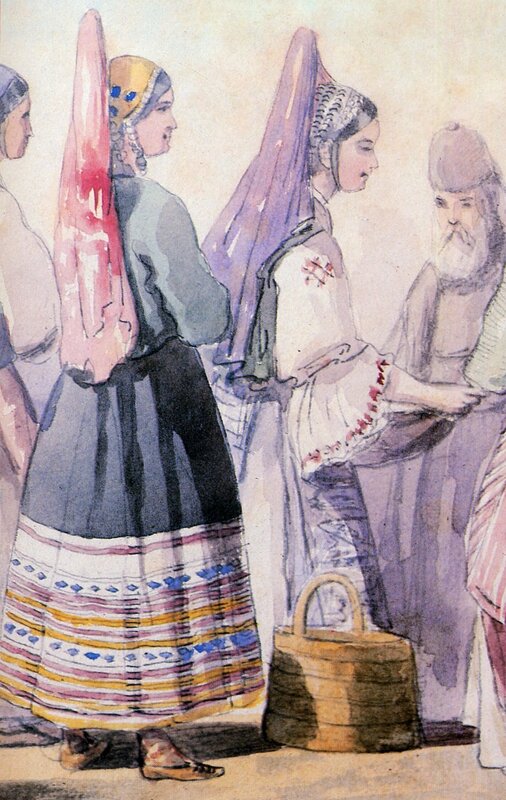 A copy of this work is available in the National Library of Serbia in Belgrade. 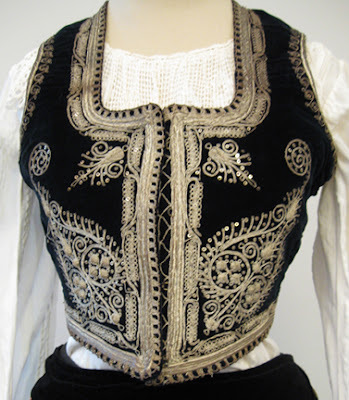 Etnography museum in Belgrade is also another place where you will be able to find gloriously preserved costumes from the 18th and 19th centuries. As you know the traditional ornaments in the textile arts of any culture change little through time, even when the knowledge of its symbolism is fading. 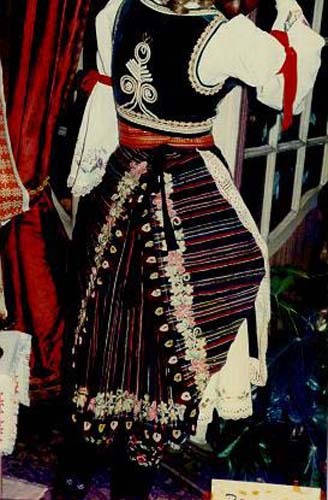 Many ornaments present in Serbian costume can be found also in Russian and Ukrainian, Bulgarian etc. Though Russians have more academic material published and available on-line. Best of luck and thank you for having such deep interest in our culture. I must say I am very surprised with Your blog and such a variety of information about national costumes. 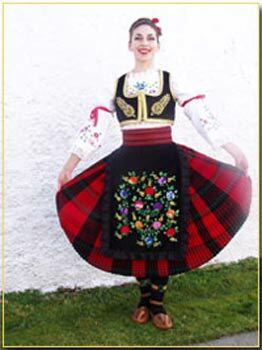 If You have any images about spanish national costumes, could You please send me some images. Now, I am working some spanish costumes. I did images about russian sarafan costumes using the image from your blog. Thank You for this image. You can find images on my blog. Thank you for sharing all this interesting material! Hi, have recently come across your blog and am finding it useful and informative. I have been costume making for about a year, and this includes amongst other things making national dance costumes for dance festivals. 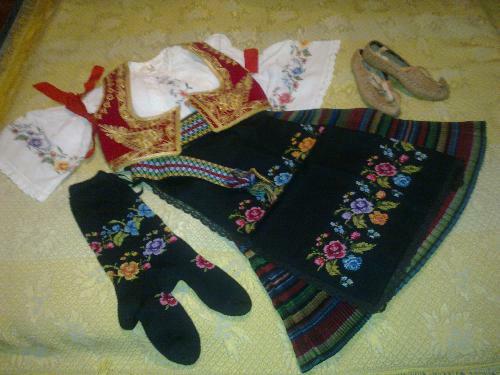 Am about to make a Serbian national costume, also have some polish to do as well. What fabric would be appropriate for the vests. Should it be wool or just a heavy cotton? Wool is certainly the most traditional. If you can find a cotton which is heavy enough and presents nicely, then feel free to go with that. Velvet is often used, but crushes easily. You want to avoid anything that is too light and flimsy, it looks bad. Often there is a third layer of cloth sandwiched inbetween the outer layer and the lining. 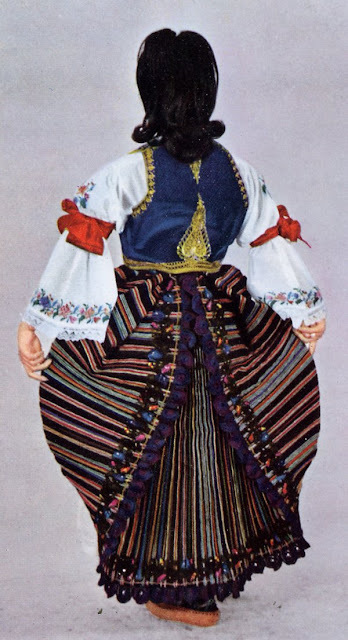 Cotton has the advantage of being less vulnurable to moths, but, of course, cotton was never grown in Europe, and so is a very recent addition to any European costume. Linen or a fine hemp is preferable, but more expensive. Linen also moves much more nicely than cotton, which is relatively stiff. Please do not make the chemises from a material which is too thin and flimsy. This is an unfortunate tendency these days. Think about how a fabric will look, and take into account how it will move, especially for dancing. Thank you, that's really helpful, will try wool for the vest. Had already bought material for the chemise and was worried it was a little heavy but given your comments think it may be ok. Will certainly be referring to your blog in the future.